In Waterbury is Extreme Paintball. They run mostly private groups, so reservations are required. They do host open play days, though, so if you don’t have a full group, you can still check them out! Reservations are recommended even for open play, if you need to rent equipment. During open play they make sure to split the players evenly so that not all of the experienced players end up on the same team. Even matches are the most fun! Their woodsball field has a great mix of natural and man-made hazards. Your adrenaline will be pumping for sure! Extreme Paintball requires all players to sign a waiver. The minimum age to play is 10. Players under the age of 18 will also need a parent or guardian’s signature. The waiver can be downloaded from their website. Yankee Paintball in Oxford is a great way to enjoy your weekend. They have open play every Saturday and Sunday. You can book private parties on weekdays. They host fun tournaments like 3v3 and mechanical only on occasion, so definitely check out their events regularly. In addition to traditional paintball they also offer Low Impact paintball, which is great for new or younger players. Smaller caliber and lower velocity means Low Impact paintball hurts less than normal paintball. So if you’ve been hesitant to try it because it may hurt, Low Impact is a great option. They have five fields, including two Speedball fields, and scenario fields for a variety of games. Yankee Paintball is a field paint only facility, but they have reasonable prices so it’s nothing to worry about. All players are required to sign a waiver prior to play. Players from 10-17 will also need the signature of a parent or guardian. Waivers can be printed out or signed electronically on their website. Located in Meriden is Hogan’s Alley Paintball. They have six fields over their 15 acres for tons of paintball fun. They have several game modes like capture the flag, team elimination, rescue, and supply run. They have scenario and woodsball fields, with both natural and man-made hazards. You’ll be able to run a variety of games on a variety of different field types, so there’s tons of ways to play! Hogan’s Alley Paintball is a field paint only park, so plan on purchasing your paint on site. Their prices are fair, for paint, as well as field and rental fees. Overall, Hogan’s Alley is a great place to play some paintball or airsoft. They are well worth checking out. Signed waivers are required for all players. The minimum age is 10. Players under 18 must also get the signature of a parent or guardian. The waiver can be signed electronically on their website. Modern Paintball Club, located in Falls Village, is a great little paintball field. They’re small, and only have open days once a month. The rest of the month they’re open by reservation only. This recurring monthly open paintball makes for a really great tradition, and definitely a great community! At Modern Paintball Club you’ll get something you can’t find at corporate paintball fields. As the name suggests they follow a Club model and offer various memberships, including trial memberships if you just want to give it a go. Their prices are very reasonable, so why not? They have a variety of scenario and woodsball fields, and a lot of different game types. Kill Box, Forest of the Dead, Containment, and Wreckage are just a few. With such a wide variety there’s something for everyone! Check out their calendar and see when their next open day is! All players must sign a waiver prior to play. Players from 10-17 must also get the signature of a parent or guardian. The waiver can be downloaded from their website. 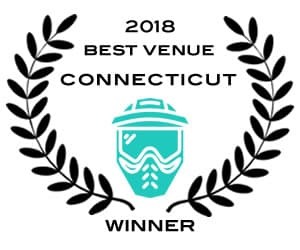 Located in Voluntown, Final Shot Paintball is a really fun paintball park. Open weekends only, and weekdays by reservation, Final Shot is a great place to spend a Saturday. They have both Speedball and woodsball fields. Plus they offer lots of different game modes, so you can mix it up! Keep things fresh by playing a variety of games on a variety of fields! Their prices are fair, so you don’t have to worry about breaking the bank just to have fun. Their staff is friendly, knowledgeable, and experienced. They even have a full service on site pro shop. Final Shot Paintball is a great way to enjoy your days off. Make sure you check it out! Signed waivers are required from all players. Players from 10-17 years of age must also get the signature of a parent or guardian. The waiver can be downloaded from their website.